I'm quilting along with amandajean...and even though the last thing I need is another quilt in progress, I just couldn't resist--everything she touches turns to gold. I'm using a Good Folks fq bundle, I think it will look great. i think good folks will look fabulous in the latest quilt-a-long. so far i have been able to resist the urge to join so i really don't need another quilt in progress either! 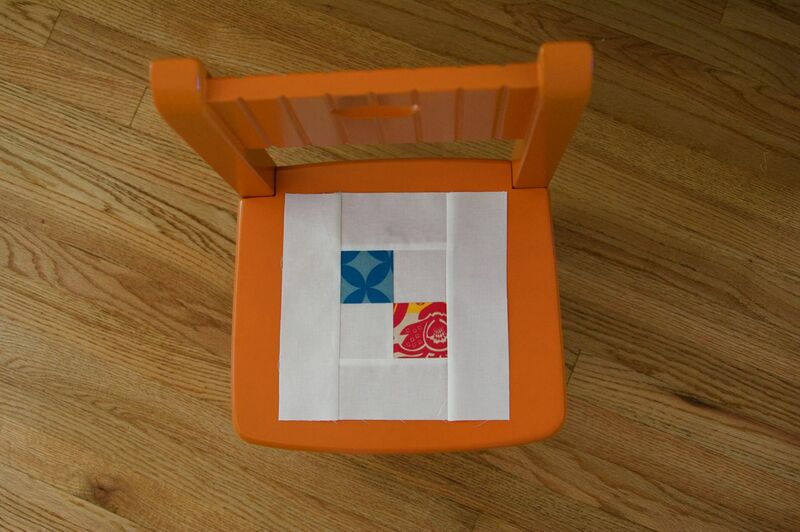 So clever the way you photographed that block on a colorful chair! At first I thought it was a chair pad/seat. lOL. Oh, man - that is making me want to join up!! Please keep posting pics of it - I guess I'll have to keep watch with the flickr group. Oh yes, that will be a fabulously colored quilt! Love it on that orange chair. I love the look of this quilt-along, so I'm hoping to join in the festivities. Love love love your first block! I just love those pops of color in the white - makes me want to start another quilt!!!! Even just that first block shows how great it is going to look! So pretty! I love the effect the white has in the block. very nice!! What do you use for your white fabric? I'm in process on a quilt and am stumped by all the "white" choices. I'm doing this quilt along too...I need to post my progress. I love the orange chair! It's going to be a pretty quilt! Yeah, I had to quilt along with AJ too, even though I DEFINITELY should not start another quilt. At all. She's too hard to resist. I think Little Folks will look lovely. I'm quilting along vicariously - I haven't the attention span it seems - last year's nine patch quilt-along saw me making multiple scrappy nine-patch baby quilts rather than the twin-sized the rest of the world made! Loving Anna Maria Horner at the moment. Just did a flannel with her fabrics. We are doing the quilt-along too...We just havent photographed it yet...been a bit slack. I am using a Swanky jelly roll & Martha is using a Hushabye jelly roll. Must get to the photos before we get behind! Same! we can never have too many projects can we? ?